Purpose: Innovation and development of devices and skill during single incision laparoscope surgery are constantly advancing. Devices using in single incision laparoscopic cholecystectomy (SILC) have been spread. The number of institution performing SILC and the patients for indication of SILC are steady increasing. On the other hand, the difficulty of SILC is high when comparing with conventional method. The smooth introduction of SILC requires to get several new devices such as a flexible laparoscope, a specialized port or bending instruments. In the performance of SILC using ordinary instruments, one of important points is a safe clipping of the cystic duct. Because we cannot easily confirm the steady clipping under the observation from the rigid-type laparoscope. To resolve this problem, we introduce the unique clip applier (AcuClip; Covidien Japan) in SILC. Method: We used AcuClip for clipping to the cystic duct in three? cases. 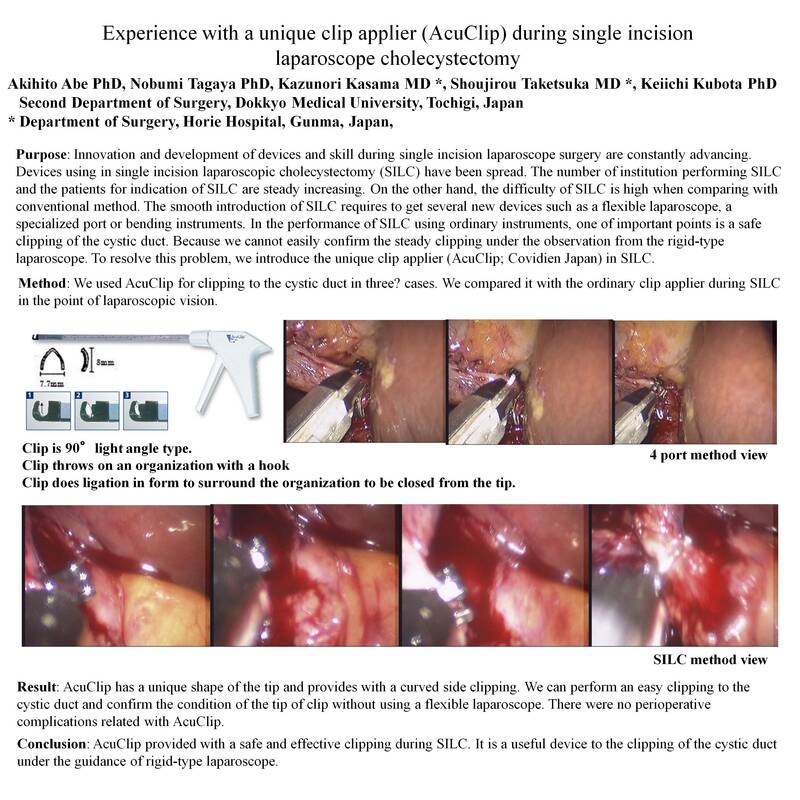 We compared it with the ordinary clip applier during SILC in the point of laparoscopic vision. Result: AcuClip has a unique shape of the tip and provides with a curved side clipping. We can perform an easy clipping to the cystic duct and confirm the condition of the tip of clip without using a flexible laparoscope. There were no perioperative complications related with AcuClip. Conclusion: AcuClip provided with a safe and effective clipping during SILC. It is a useful device to the clipping of the cystic duct under the guidance of rigid-type laparoscope.